Essentially, there is no way to define the bottom extents of Topo. So while Pads can be used to push Topo down, there is nothing that will push it up or create a void in the middle of it. 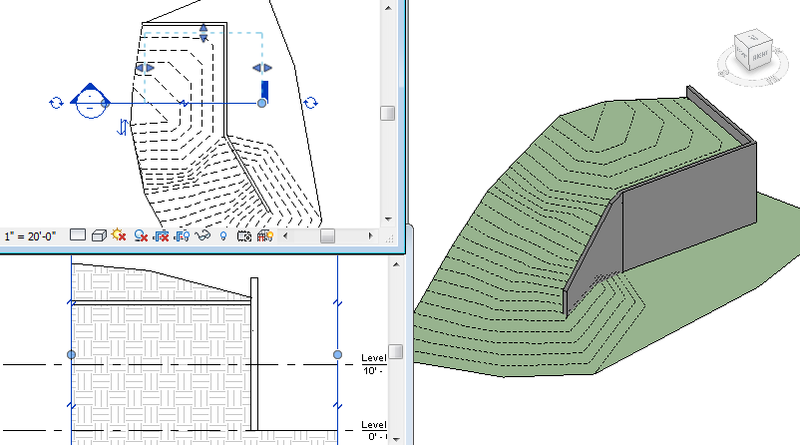 And since Topo defies all the rules of typical Revit geometry, this also cannot be done with in-place Voids. So how do you model the “Topo” on top of the structure? One of the most commonly used workarounds is using Floors or Roofs. They work quite well if you have a consistent thickness, but you can also Shape Edit them via Modify Sub-Elements to create a more topo-like surface. This Floor has a thickness of 10 feet, which when combined with an In-Place Void, allows the Floor to have a varying thickness. For some reason, once the Void cuts the Floor, its hatch pattern disappears in section (to turn it back on, I had to override by Element). The worst part of this workflow, is managing the seam between the Floor and the Topo. Ideally, you would want to eliminate the seam or at least make it as small as possible. You also do not get contour lines from Floors, so if you wanted them they would have to be drawn in manually. With some overrides (in Section) and edges turned off (in Realistic Mode), the final result isn’t half bad, though the Floor is not quite as smooth as the Topo around the edges. Huh, the top piece of Topo as a linked file? That is an interesting concept, but it would difficult to manage. I think it could work fine for an architectural site that is more for visualization. But for a landscape that is being maintained and modified in Revit, I think it probably would not be very feasible. I agree, the good thing would be using Dynamo, a macro or some external command to generate a CSV that can be used to generate the topo. This way if any changes happend in one file, it would be possible to recreate the exact same points in the other. Yeah, something more automated would be ideal. But the Topo tools really just need a complete overhaul. They are just not practical. I have a suggestion that might work but it would involve introducing another software program into the mix. You could model the topo in Rhino and then link it to your Revit model using Rhynamo. I don’t know if this would work or not but it’s probably worth investigating further. Rhino is certainly a tool used by many landscape architects to model topo. But since I do not have access to the program, I am somewhat limited into looking into Rhynamo. I am starting to get into Dynamo, though, so you can expect some Dynamo posts sometime in the near future.